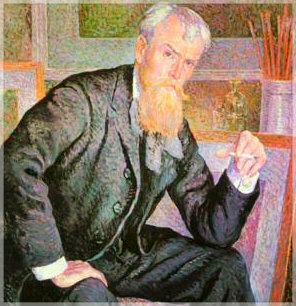 In the early 1880s, in the wake of impressionism, French painter Georges Pierre Seurat pioneered a methodical and scientific technique known as pointillism or divisionism. Seurat juxtaposed small dots of pure color together to maximize luminosity. The dots appeared to intermingle and blend in the spectator's eye. Distinguished art critic and historian, Mardsen Hartley observed "The artist remains the artist precisely in so far as he rejects the simplifying and reducing process of the average man who at an early age pu ts Life away into some snug conception of his mind and race. This one turns the key. He has released his will and love from the vast Ceremonial of wonder, from the deep Poem of Being, into some particular detail of life wherein he hopes to achieve comfort or at least shun pain. Not so, the artist. In the moment when he elects to avoid by whatever[xii] makeshift the raw agony of life, he ceases to be fit to create. He must face experience forever freshly: reduce life each day anew to chaos and remould it into order. He must be always a willing virgin, given up to life and so enlacing it. Thus only may he retain and record that pure surprise whose earliest voicing is the first cry of the infant. Require more information about the famous artist Henri Cross in Art History? Type your query in art into the google search box below and poke around every nook and cranny of the known universe for information this subject. Do you know something we don't? If you have comment or would like to share an insight regarding Henri Cross in Art History, please submit your comment to the editor, via e-mail and if possible site the source. Thank you!